Jonathon Green writes about ancient technology they had when he was a boy. Ah yes, my little ones, we used to have these brick-shaped “cassette recorders” into which you’d put tape cassettes, which were easier to use and more portable than reel to reel (should I add a tag for “archaeology”?) but nevertheless were dreadful little cursed demons which would jam, break, tangle and inevitably lose their audio quality as the magnetic tape deteriorated – or they’d stretch the tape so they sounded like the dying HAL 9000, a character from a story also about ancient technology. My first cassette recorder was just like this. I got mine when our family stopped over in Hong Kong on the way to the UK. (My Dad had a job close to Oxford, and the family relocated to a little village called Ewelme for six months.) It was a primitive system. There was an attachable, not built-in, mic which we used to record “radio programs”. My brother R, whose birthday it is today, was eleven at the time. I was thirteen, or “old enough to know better”, as you’ll be muttering darkly when you’ve finished reading this story. Ewelme was the cute English village from central casting to a ridiculous degree. Think Midsomer Murders (in fact, it’s been used as a location for filming MM on occasion.) We had fair-dinkum stone cottages, narrow hedged lanes, streams full of watercress and a lytel church going back to Chaucer’s time. My stepmother, being the bright and sociable person that she is, started enthusiastically forming friendships with people nearby. One rainy weekend, my brother came up with a wicked idea for the tape recorder. He put a blank cassette in the machine, fast forwarded it to about ten minutes in, then he shrieked and howled and moaned for a minute or two like a soul suffering the tortures of the damned. So, you had ten minutes or so of silence and then all hell broke loose. That morning, mum had invited one of the nice local ladies over for tea. 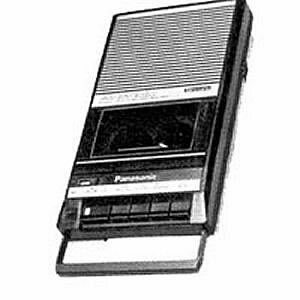 R hid the tape recorder behind the sofa, plugged in with the tape rewound to the beginning. When he heard our unsuspecting visitor coming in to sit down, he pressed Play and we scarpered upstairs to await the ensuing consternation and LULZ. We were horrible children. I apologise to my parents, to that poor woman, to everyone, really. Happy 50th Birthday, R.
An ipod just isn’t that fun, even though it’s easier to get in one’s pocket. Little rotters. Miss Ten has just been agitating for voice recording device of some sort; I feel even more dubious about it now. Ah, but cut and paste was REALLY cut and paste (ok, splice). Besides, throwing dead spools of tape around as streamers was fun…. throwing around MP3 players (and especially CDs) is a little more dangerous. I remember those days well. The recording from radio bit. Not the 10 minute silence followed by howling of the damned bit. Wish I’d thought of that 30 years ago. Bravo and happy birthday R! I, um, still own one of those tape things. Oh, I love it … that’s a classic! I used to lure my brothers and sisters into my room, where the tape recorder would be secretly on, and record them until they noticed, luring them to do or say silly things, whereby we would gang up on the next sibling and so on. iPods just aren’t up to that sort of fun. My brother and I waged a constant battle for a couple of weeks of attempting to stuff up each other’s radio recordings of our favourite songs. Nothing like standing outside the door and screeching “Muuuummmmm” at the top of your lungs just as Split Enz is starting and you hear the click of the record and play buttons. Ahh, good times. Kath and Mindy, although I’ve probably revealed enough shameful stuff already, I also recorded entire Frankie Howerd programs off the TV (there were such things as input cords, but TOO TECHNICAL for our ancient TVs) and chortled over them about 10,000 times. Nudge nudge! At school (eons ago) we recorded two girls laughing at/with/for each other. They laughed a lot, these two and you could hear them all over the school. They knew they were being recorded which only made them laugh all the more. The recording went for about twenty minutes with periods of what sounded like silence but if you listened carefully you could hear the high pitched squeaks of them taking in air. It was the funniest, simplest thing I’ve ever cried laughing over. (Something I haven’t erased from my memory of school). My father recorded himself reciting Clancy of the Overflow on a machine very similar to the one you had. He was as pissed as a newt –apparently. He never spoke about it, but I came across the tape in a desk drawer. It was excruciating to listen to and is a gem to have. . . . somewhere. And one of my favourite pieces of equipment at Art School was the Sony Professional Walkman. With headphones on and microphone turned up, you could just about hear the termites in the walls I loved it. I used to love making recordings of ambient sounds. Congratulations to him, and I’m astonished you’re near that age yourself, you always seem so young. Oh, what a great memory. My mother confiscated my old radio when I was in early adolescence for some minor transgression that neither of us can remember.. and she never gave it back to me and when we found it in her cupboard recently it was still tuned to some crappy pop radio station (that no longer exists) and was covered in kitten stickers. I couldn’t help but feel very sad for my poor deprived, uncool just turned teenager self. I still have my walkman for those sleepless nights and the permanent cauliflower ear from sleeping on the earphones. Did you have a favourite pencil, it had to be a pencil, to push into the middle of the tape to tighten it up? My father had a machine like this and would rush home from the pub to record whatever joke he’d heard in the bar. It was great after he died to find those cassettes and hear his voice again. As kids me and my sister taped my Dad snoring. Later when we played it back to him he got angry and denied that was him on the tape! We still listen to a tape recording of Ausie rock bands which my wife gleaned from the radio back in the 80s… or was that the 70s? There’s a Cold Chisel song called ‘Goodbye (Astrid goodbye)’ which makes some rather derogatory remarks about ‘Astrid…’ In the middle of the song just after a particularly nasty remark somebody accidentally hit the record button right at the time there was a news report about sexist behavior on the radio! It couldn’t have been staged any better! Actually come to think of it. It took me years of bungled double recordings to realize that when you punch out the tabs on the skinny side of the cassette you can prevent them being overwritten! At least I knew to place the tape recorder between the speakers of a stereo system. Ah yes the broken plastic tabs. Space age technology: We haz it. I recall that R also used the time in Ewelme to prepare for his future career in water engineering by damming the local stream! I recall this caused some local concern as the only local inductry other than housing Oxford academics, was growing water cress.